Lifton peers into the lives of physicians who killed millions. He examines the beliefs and practices of Nazi culture, which provided a biomedical context for ridding Germany of disease by exterminating those targeted as responsible for such disease. In an evil irony, healers frame killing in an expanding narrative that ultimately reaches the level of genocide. In addition to records, Lifton included interviews with surviving Nazi physicians and some prisoner doctors who served as their underlings in Auschwitz. Lifton discloses his perspective, which is that of a an American psychiatrist, a Jew, with a psychoanalytic perspective informed in part by the ideas of Otto Rank. In the Introduction, Lifton informs us of key elements of his psychological model. People seek to deal with mortality by seeking immortality in various life projects. Many also seek to deal with limitations via transcendance. He refers to Rank's notion of "immortality systems" to help gain a sense of the meaning of the Nazi's "Thousand Year Reich" in which ordiniary Germans and professionals could be bound together in an uplifting and eternal endeavor. Lifton also shows us that in the mass killings of Jews and others, especially as seen in the death camps, the Nazis crossed a significant barrier beyond that kind of episodic violence, which targets hated people here and there to reach a systemized elimination of certain human lives based on the logical extension of a distorted biomedical theory that harnessed physicians to a gross expansion of euthanasia to the selection of multitudes of Jews for lethal "cleansing." In Part I, Lifton explains the early Nazi medical killing program of euthanasia presented as "life unworthy of life." There were several components beginning with required sterilization then the killing of "impaired" children and adults in hospitals-- mostly mental hospitals. The practices of injection and carbon monoxide poisoning were eventually expanded to inmates at concentration and extermination camps and then to mass killings. Part II focuses on Aushwitz. The SS doctors performed the initial selection of arriving prisoners either for the gas chambers or temporary survival. Additional selections followed as doctors "examined" prisoners' fitness when overcrowding or health conditions commanded their attention. The "unfit" were of course selected to die in this bizarre application of triage. Lifton closes this section with three chapters each devoted to a close look at three physicians. One he considers a "human being" in an SS uniform, the other, Josef Mengele, identified as "Dr. Auschwitz," and the third, Eduard Wirths a representative of the "healing-killing conflict." The final Part III examined the psychology of genocide. Lifton explains his view of the concept "doubling." Nazi doctors form two selves to cope with death. The previous physician self is the healer, which emerges from time to time. The Auschwitz self takes on the numbing routine necessary to psychologically survive the initially shocking assignment to carry out selections of people for immediate death. Lifton addreses some additional themes related to genocide and mentions some similarities of the Nazi killings to the earlier Armenian genocide. Overall, I found Lifton's work informative and worthy of consideration given the indepth interviews with Nazi and other physicians who survived the almost indescribable horrors. His analysis of "doubling" is interesting because he provides numerous examples of how this construct may help approach an understanding. Unfortunately, like many mental constructs there is a circularity that fails to satisfy my desire for a closer look at causation. Lifton does mention the cultural mileu and even provides historical perspectives that no doubt bolstered the German biological view of a healthy and superior race in contrast to those people viewed as a subspecies who were unworthy or even dangerous to life. It is this milieu, and an understanding of social psychology, that I think would offer a more useful explanation as we continue to confront extreme outgroup hatred. Another perspective I would like to have seen is a more careful analysis of moral psychological perspectives. In fairness, much of moral psychology research has taken place in the last couple of decades and would thus be unavailable to Lifton. Nevertheless, contemporary readers would do well to consider the work of Jonathan Haidt (The Righteous Mind) and others to examine the scheme of justifications employed by the Nazi's in their killing narrative. Finally, Lifton appears to have ignored the work of Zimbardo and the well-known 1971 Stanford Prison Experiment, which offers empirically supported ideas for considering the rapid shift from fellow citizen to the split roles of guardian-inmate. A quote from Zimbardo is relevant. "How we went about testing these questions and what we found may astound you. Our planned two-week investigation into the psychology of prison life had to be ended after only six days because of what the situation was doing to the college students who participated. In only a few days, our guards became sadistic and our prisoners became depressed and showed signs of extreme stress. Please read the story of what happened and what it tells us about the nature of human nature." What we can glean from Lifton's research is the perspective of a psychiatric physician who offers us a face-to-face encounter with some of history's most malevolent and scariest beings-- healers turned killers. Lifton, R.J. (1985). 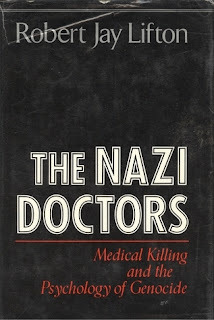 The Nazi doctors: Medical killing and the psychology of genocide. New York: Basic Books.